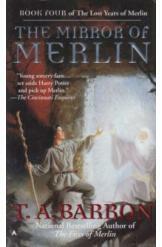 The Mirror of Merlin, book four of The Lost Years of Merlin by TA Barron. Book in an excellent condition, all pages intact. There is something wicked in the swamplands on the magical isle of Fincayra, an encroaching evil intent on destroying the land and only young Merlin possess the power to stop it.